I have been considering my destination and the path that must be traveled. A path that is often very difficult. A rough road. My brothers, consider yourselves fortunate when all kinds of trials come your way, because you know that when your faith succeeds in facing such trials the result is the ability to endure, but make sure that your endurance carries you all the way so that you will be perfect and complete, lacking nothing. When my faith succeeds in facing trials. Another way to say that is to use the definition of faith we find in Hebrews: When my assurance of things hoped for and my certainty of things unseen succeeds in facing difficult times, frustration, pressure, irritation, the result will be endurance, perseverance. I used to hang around some Christ followers who often talked about the crowns they will have to offer Jesus, I think this comes from Revelation. We would encourage each other that our obedience or good deeds, good works would translate into jewels in this crown and we would someday offer it to Jesus as we worshiped him. As I reflect on that now, I never really gave any thought to the process through which some jewels are made. Like diamonds or say pearls. God chose to form diamonds with sustained pressure. Unbelievable pressure over a very long time. Pressed but not crushed. That is how carbon becomes a diamond, a tough and beautiful stone. And then there are pearls. 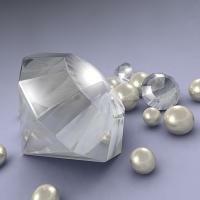 Pearls are the result of something foreign entering an oyster. This foreign matter is often a small piece of sand, but it is very irritating to the oyster. And it doesn’t go away. So the oyster over a very long period of time secretes something that covers the irritant until the final result is a pearl. So consider it pure joy, my siblings, when life presses in on you, or irritants plague you, for when your certainty of God’s love and your assurance of his sovereignty succeeds in facing the stress and irritants, the result will be diamonds and pearls. But make sure that your endurance carries you all the way, you must persevere to the end. If you spit out that irritating piece of sand, or if you dodge the pressure the result will be that you remain a lump of coal, or an empty oyster.